A reader points out a gap in my Stealth Fraud/Open Fraud framework. Call it the Cara e’ Tabla Fraud. After a night of wild speculation, the CNE cadena finally starts at 2 a.m., and we see Tibisay saying Chávez won with 51.7% of the vote. 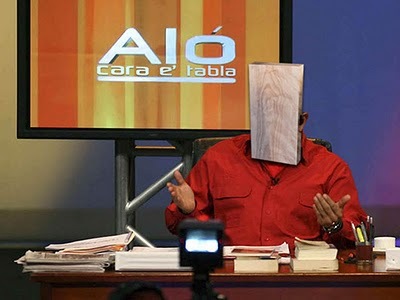 At 2:10, Leopoldo López and Ramon Guillermo Aveledo come on Globovisión with stacks of actas in hand saying “we have the evidence that shows Capriles won and CNE’s announcement does not match our acta tally.” But at 2:09 on VTV we see Aristóbulo and Cilia Flores waving another set of papers in the air saying their actas prove Chávez won and the opposition is lying. They throw around the standard gringo conspiracy allegations, and threaten to jail opposition leaders for destabilizing the newly re-elected government. The next day, half the country is convinced there was fraud, the other is equally adamant that there wasn’t…but all the institutions toe the line. A Cara e’ Tabla (Deadpan) Fraud of this kind is an epistemological halfway house between the Burma Scenario (an open power-grab) and Stealth Numerical Fraud, which would be hard to pull off. In this scenario, anybody who spends 5 minutes looking at the evidence can easily see the election’s being stolen, but that doesn’t change anything. Leveraging its communicational (and institutional) hegemony, the government deadpans its way through the resulting firestorm, cracking down on the opposition and muddying the discursive waters enough to muddle through. There may be thousands of fraud witnesses around. The bits of paper Aristóbulo and Cilia wave around may not even be the right size and format. It may be trivial to prove to an impartial judge that the opposition’s actas are real and the government’s are fake. None of it matters because there is no impartial judge to appeal to. Chavismo’s made good and sure of that. As I think about it, I realize this scenario is chillingly plausible. Chavismo’s repeated warnings that the opposition will cry fraud on October 7th sure seem designed to increase its chances of success, or at least to leave it open as an option. The approach would be entirely in character for a movement whose Orwellian streak is well documented. After all, if there’s one thing the National System of Public Media has shown is its willing to crank up the propaganda machine to hammer in even the most outrageous lies. A government that’s had no problem trumpeting the claim that Barrio Adentro has “saved two million lives” even though it’s trivial to demonstrate that’s not just false but absurd, a government that spent millions celebrating a wholly fictitious Erradication of Illiteracy, then millions more celebrating its five year anniversary even though its own statistics show the claim to be false, a government that’s made a sneering contempt for reality a hallmark of its discursive style…such a government would find this kind of fraud almost routine. It’s a given that, if it’s on VTV, the next day millions of dyed-in-the-wool chavistas will take its word as holy writ, as probably will Itamaraty, Casa Rosada and in time, with an eye on bilateral trade flows, Palacio de Nariño. How the White House reacts in this scenario, less than a month before their own elections, is an open question. To the extent that any fraud is possible, I think Deadpan Fraud is by far the most likely scenario. But I also think it would be an extraordinary high-risk gamble, one that could easily backfire in any number of ways, from Tibisay Lucena balking at the last minute to a spasm of street unrest. More than anything, I think Chávez knows a Cara’e’Tabla Fraud risks breaking the unity of the military chain of command, and that’s not something he could take lightly. Which doesn’t mean he won’t try it, or that it won’t succeed. It just means that when he’s scenario planning October 7th, Deadpan Fraud is his last, worst option.